Now she is a wonderful young woman and I'm so proud of her. Some days are so beautiful they really get inside of me. On a perfect day, while walking or driving through sun and shadow, catching glimpses of sunlight through leafy trees, I can honestly say, my spirits soar and I carry that feeling through the day. We have had such a week or two here in New England and, except for cooler temperatures, there is barely a hint of Autumn. Today it is raining hard, but making this picture reminds me of the blissful feeling I have had on a many a beautiful day. 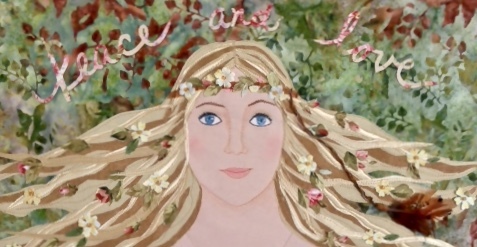 I am entering this picture, which is done in cut paper and colored pencils, in a challenge on a new blog called Embrace the Face. This month's theme is "Tree", and I'm anxious to see what others have come up with!! 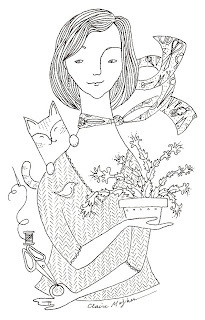 I came across a wonderful artist while searching for blogs about paper cutting. Her name is Claire Mojher and her blog is here. You'll first come across 2 portraits called 'Phil and Melanie'. When you read Claire's description of her process, you'll find some humorous details within the portraits, which, I think, are done with marvelous flair and attitude. Scroll down to her August 27 post and you will see a gallery of some of her previous work, including her charming layered paper girls. I'm a big fan of her work! So, do pay her a visit, leave a comment and enjoy!! Here is a fabric picture I did a few years ago. It is fabric applique edged in machine satin stitch. During that time period, I would never let a raw edge of fabric show in my work! 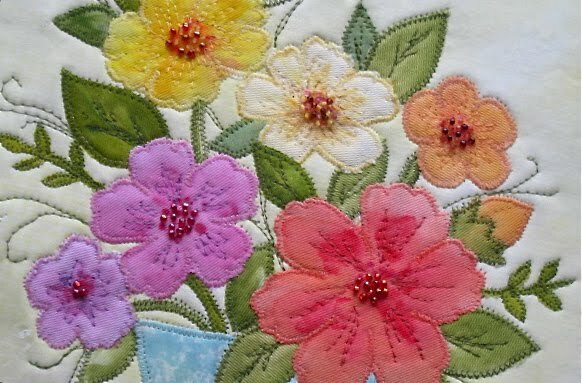 Now many fabric artists work entirely in raw edge applique, and I often do, too. For those who saw or commented on my last post, I reshot the photo and I think it looks a lot better now! I've decided to work with "themes" for a while on my blog. Just another way to motivate myself!! For the rest of September, my theme will be "Faces" - something I love to do, and I have many ideas floating around in my head on this subject!! This little girl is dressed in her Sunday best. 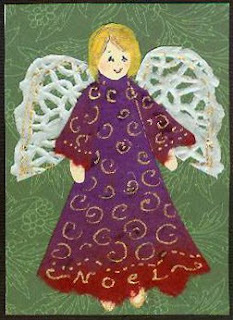 She is just a little ATC and she is made with fabric, paper, and marker. The fabric part is her hair, some random bit of shiny fabric I had, and it was tough to photograph!! Although not that shiny, it produced a terrific glare with the flash! I'm hoping to scan things like this in the near future when I get my scanner working properly. The rest is paper, including the lacy collar and cuffs. I feel like I haven't posted in ages! Busy times!! 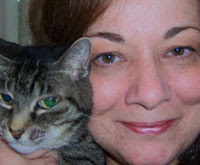 My friend Janice sent me the terrific ATC on the left just recently. 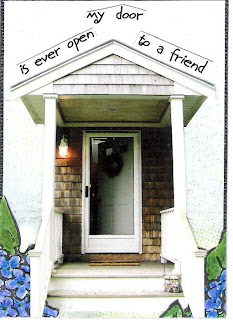 It is a photo of the front door of her house on Cape Cod, where I visited her last month. The flowers are hand colored replicas of the gorgeous hydrangeas which grow there. Janice is a real beach comber and collects beautiful stones which fill baskets around her home, including the one here on her steps! She has just started a blog in which she writes about her life on the Cape and her ambitious walk along the Cape Cod National Seashore. 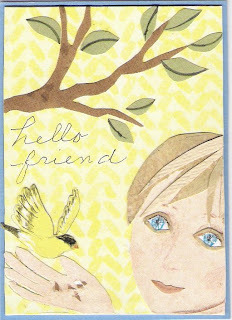 She also is an avid creator of ATCs and makes one nearly every day! 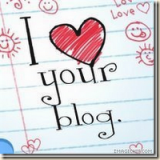 You can find Janice's blog here. 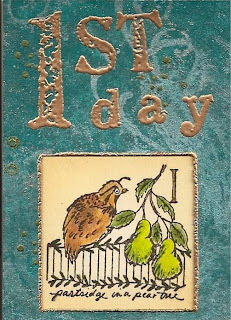 My August ATC for Janice speaks to her love of birds. Sitting on her front porch, she gets lost in watching a great variety of birds which come and visit her various bird feeders and bird bath. Beside her is a guide and the arrival of a never-before-seen bird is cause for great excitement! It's already getting close to the middle of September and soon it will be time to exchange cards again! 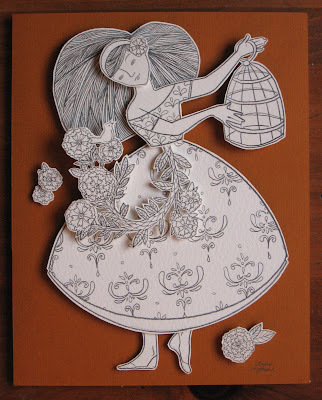 Here is a young lady, created from cut paper, which I made this summer for a card I sent to Ellia from greenbeanbaby art. I mounted the artwork in a cardstock mat and glued it onto a premade blank card. The picture is a bit blurry, and I apologize for that. School has opened and I'm back to tutoring! It looks like a busy Fall and I'm trying to decide which new projects I want to pursue! I've grown very fond of working with paper lately, but also want to do some collaging with fabric. I'm hoping to come up with a plan for the rest of the year and have some fun with it! Today I added some needlefelted flowers, and some shading to this piece and I think it looks better. I did find that working with wool was difficult because of the bulkiness of the fabric. The next time I do this , I'll lay the pieces flat and outline each section with a blanket stitch. I probably could take the felted flowers further, but I didn't want to overdo it. Like many others, I'm thinking today about the people who are in the path of Hurricane Gustav, and adding my thoughts and prayers for their safety and well being.